or 3 Help Hair Conditioners plus 1 Help Shampoo. Just state in comments. All combos have Free Shipping for our Amazing Shampoo and Conditioner! I use the Help Hair Shake and Help Hair vitamins daily. Along with the RescueMD Shampoo and Conditioner. These products saved my hair that was falling out all over the last year. I had a severe illness and recovered but my hair suffered. Within 1-2 months of using the products my hair came back to life. I stopped shedding and my hair got progressively thicker and now after 5 months my hair is back to normal. Great customer service too! No more damaged looking hair. My hair was damaged from all the coloring. No more damaged looking hair because the shampoo and conditioner gets rid of the broken split ends and my hair is growing in areas that were damaged from all the years of dyeing it. I have been slammed with working 60 hours a week and have not had time to rest and even eat properly. My new job was overwhelming and I started to lose hair after around 4 months into it. My best friend went to Dr Jerry Cooley in Charlotte and he was using the shakes for over a year and I could see the amazing results. He hair was thicker his bald spot filled in. I have been using the 4 Step Program which he was using which includes the shake and vitamins daily along with the Help Rescue MD shampoo and conditioner. I could not believe after 3 months my hair started to get thicker and fuller and stopped breaking. After 6 months my thinning areas were filled out and now at 7 months my hair line has filled in. If I did not see it growing back on my friend I would never have believed it. I would give these products a 5star rating! The Shampoo and Conditioner is so nice that my husband is using it and I have to reorder frequently! The Shampoo and Conditioner is so nice that my husband is using it and I have to reorder frequently! Cant say no to him so I ordered the double pack which has free shipping! Rescue MD Shampoo and Rescue MD Conditioner are the best! Rescue MD Shampoo and Rescue MD Conditioner are the best! My hair looks and feels great. I see new growth on my hair line. I like the fact the Double Pack has free shipping. 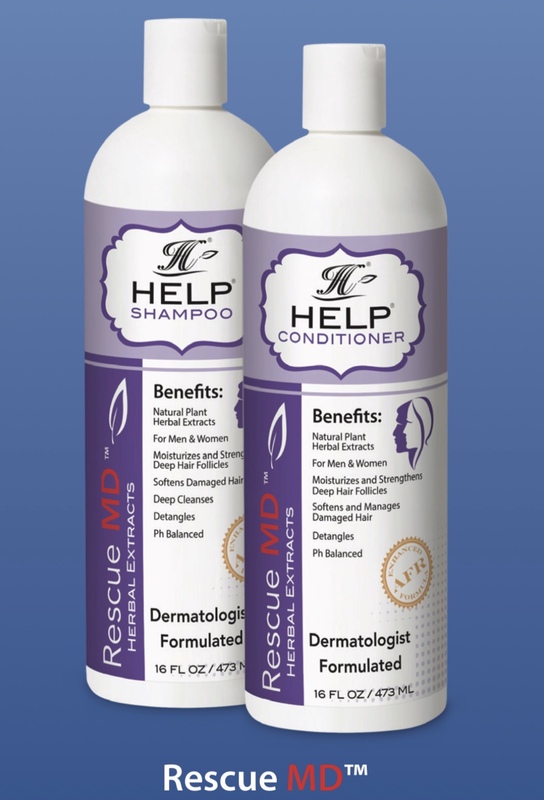 I buy the Help Hair vitamins with great success and use the Rescue MD Shampoo and Conditioner which are amazing! Really great shampoo and conditioner! I am using the RescueMD Shampoo and Conditioner and my hair is starting to regrow. It helps my hair since it is damaged from hair coloring and I have patches of hair that have fallen out. So happy to see my hair regrowing in. Feels like my hair was washed with shampoo and conditioner from a professional hair salon. I use the shake and vitamins. They work great. Now I added this new product. It smells good and makes my hair feel bouncy and look shiny. The shampoo is pearlescent so has a nice feel when you lather it into your scalp. I like the Rescue MD conditioner too even though I typically do not use a conditioner and it feels "weightless" and does not make my hair feel limp but actually feels clean and "groomed" like I just had it professionally done in a hair salon. Click the button below to add the Rescue MD™ Double Pack - 2 Help® Shampoos and 2 Help® Conditioners with Free shipping to your wish list.